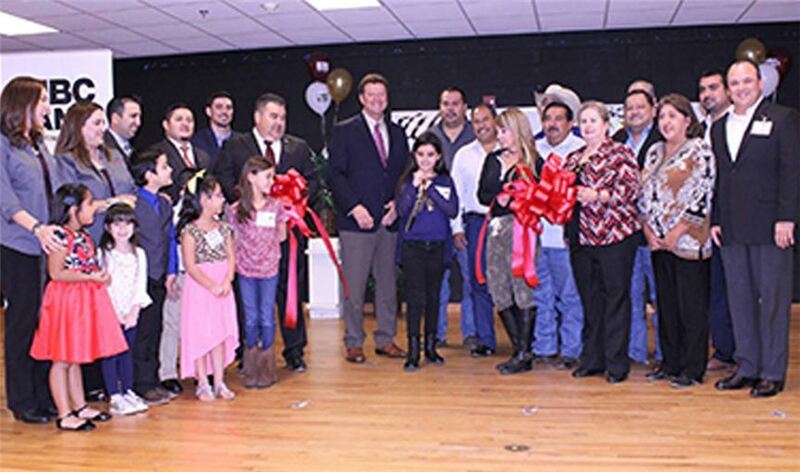 Jocelyn Flores, center, student at Fidel and Andrea R. Villarreal Elementary School Minitropolis "Villarrealville Judge" is pictured above with Ricardo Ramirez, IBC Bank-Zapata President and CEO and other Villarrealville citizens and partners. Villarrealville, a mini city run by students inside Fidel and Andrea R. Villarreal Elementary School celebrated the grand opening of its Minitropolis program with a ribbon-cutting ceremony on Nov. 17, 2017. The Minitropolis program allowed students to see how a community works together for the good of its citizens. Through the program, the children at all grade levels held a variety of real world positions, depending on their individual interests and passions. IBC Bank-Zapata President and CEO Ricardo Ramirez, Zapata Chamber of Commerce officials, Zapata County Independent School District administrators, along with the U.S. Postal Service and RSL Waste Management representatives, were present to commemorate the occasion.